Erected by William GILCHRIST, in memory of his father James GILCHRIST who died at Meadowhead 25th Feb 1863 aged 46 years. Also of Euphemia CLEMENT GILCHRIST, his daughter who died at Meadowhead 23rd Sept 1878 aged 13 years and nine months. 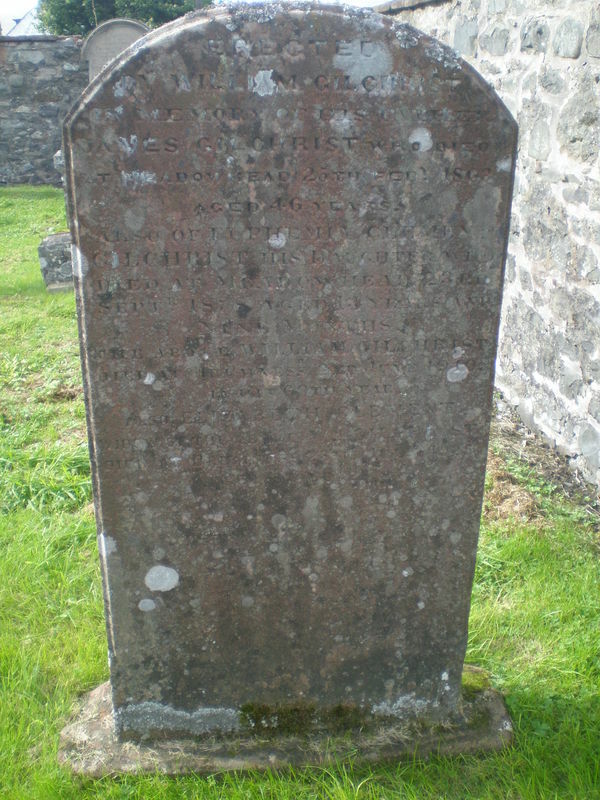 The above William GILCHRIST died at Drumness 2nd June 1910, in his 69th year. Also Elizabeth CLEMENT widow of the above Wm. GILCHRIST died at Drumness 28th July 1925 aged 87 years. GC, “Kirkyard gravestone 2,” Carsphairn Archive, accessed April 21, 2019, http://carsphairn.org/CarsphairnArchive/items/show/108.